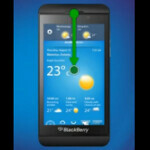 Earlier this month, we showed you a leaked video tutorial for the BlackBerry 10 L-Series handset. The gestures displayed in the video allowed the user to see the tool bar on the top of the screen by pulling down on the display. At the same time, a tool bar on the bottom disappeared. An upward scroll of the screen reduced the image to thumbnail size. This time, the image on the screen reveals a weather application rather than the travel website or app that was seen on the first leak. The gestures appear to be the exact same as seen previously. Like the first leak, it isn't much but it does show us how the gesture based UI handles some tasks. What do you guys think about this early look at BB10? Uhmm, 32 seconds "WOW!!!". Well at least its something. I just don't know. I just don't know its anyones call as to how RIM is gonna do. yup garbage is right and with all the delay and stuff, I say the magic of BB hype is long gone! Doesnt look anything special or new but Blackberry certainly needed a massive revamp. What rim really need to sort first is the actual blackberry services,the amount of customers complaining bbm services are down for periods at a time as well as appworld etc is a pain,its mostly young teenagers using blackberry handsets these days and they are extra painfull in complaining about it! Leaks are appreciated anytime anywhere. their beta phone is ugly..
OMG they aren't going to make it period!. Well one thing we should do is Stop Calling this Videos leaks it's obviously to build hype for the OS release not some mistaken video upload by a company thats just 17 mins walk from my apartment. But nice features! love it!!!! can't white for2013!! !